In large bowl, toss together radicchio, carrot, green pepper and onion. For Dressing, in small saucepan stir together vinegar, oil, sugar, salt, mustard, celery seed; heat just to boiling, stirring to dissolve sugar. Pour over vegetables and toss well. Place in serving bowl; cool to room temperature. Garnish as desired before serving. If not serving immediately, cover and refrigerate for up to 4 days. 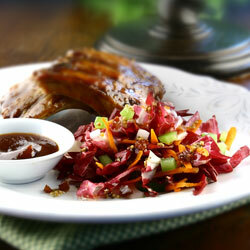 Shortcut tip: Substitute bottled Sweet ‘n’ Sour Dressing for homemade dressing.